Find out when your favorite activites reset, and when Xur will come back with Exotics in this Destiny 2 Roadmap. 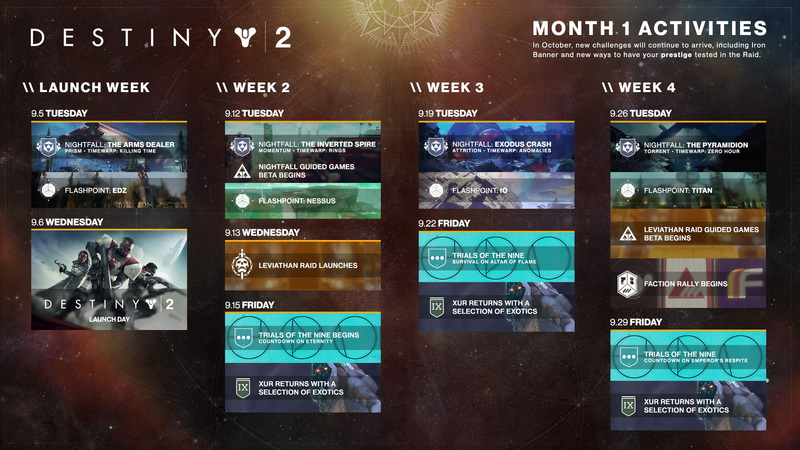 During the first weekly update of the Destiny 2 era, Bungie has revealed the dates of important moments in the first month of Destiny 2. We knew for a while when Trials of the Nine and the Leviathan Raid would first appear, but the new roadmap confirms the dates and even adds a few new surprises. The Destiny 2 September roadmap has released the mode and map for our first weekend in Trials of the Nine. As some speculated, the first Trials mode will indeed be Countdown. The Countdown mode is 4 on 4, as opposed to the 3v3 of the original Trials, and will take place on the Eternity map. The 15th also happens to be the return of Xur, which may be tied into the lore of Trials now that the tournament is for the Nine instead of Osiris. Bungie also revealed a previously unheard-of event, the Faction Rally. Factions have yet to be seen in Destiny 2, but this would indicate they are on their way back and will have a timely event tied to them. If you want to rank up for these events, check out our guide to hit max level as fast as possible. Stay tuned to our Destiny 2 guide for more on everything you need to know about Destiny 2.